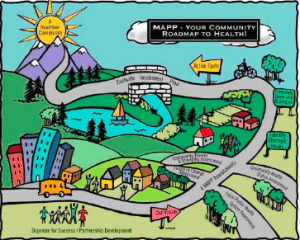 A Community Health Improvement Plan (CHIP) is a strategic tool for improving the health of a community through a collaborative process of identifying health needs and opportunities specific to that community. The CHIPs listed below reflect the dedicated work of broad community cross-sector engagement. Many stakeholders, staff, decision-makers, and other interested persons participated in a series of facilitated meetings to discuss and prioritize community issues. There is no cookie-cutter approach to address health issues in each of the 77 counties in Oklahoma – each county is different. More importantly, there are many people concerned about similar issues. Community issues of concern in each CHIP are often either similar to or “mirror” those in other CHIPs. These similarities &/or commonalities reveal opportunities for greater inter-sectoral collaboration and strategic partnerships to create synergy to address these complex community issues. In the examples from counties throughout Oklahoma below, see which community sectors are at the table or which ones may need to be invited. 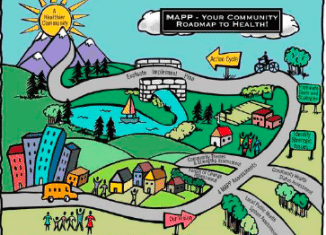 Or, get “connected” with what your surrounding communities are doing, and create greater synergy and/or potential needle-moving community collaboration. Interesting and valuable information. Thank you.